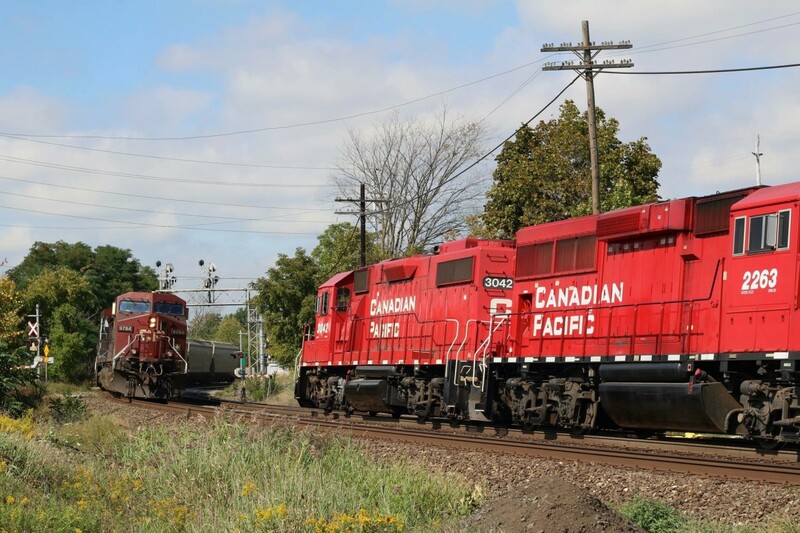 Railpictures.ca - Marcus W Stevens Photo: Today both T14 and the OBRY arrived at Streetsville early, and T14 did a rare Friday switch at Ardent Mill. Here we see T14 awaiting the arrival of the headend crew as they prepare to head for the yard after lifting four cars at the elevator. A very short six car eastbound has just dimmed it’s ditch lights as it storms around the curve at the Mississauga Road crossing. | Railpictures.ca – Canadian Railway Photography – photographie ferroviaire Canadienne. Caption: Today both T14 and the OBRY arrived at Streetsville early, and T14 did a rare Friday switch at Ardent Mill. Here we see T14 awaiting the arrival of the headend crew as they prepare to head for the yard after lifting four cars at the elevator. A very short six car eastbound has just dimmed it’s ditch lights as it storms around the curve at the Mississauga Road crossing.